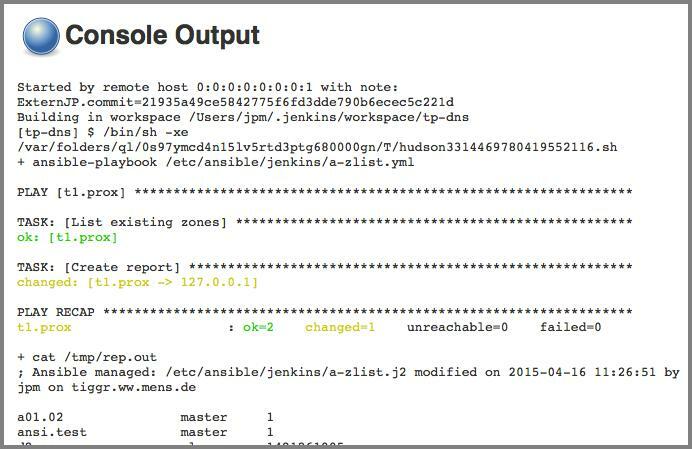 It must have been over a year ago that somebody mentioned Jenkins is not just a tool for developers; system administrators can also put it to good use. I recall glancing at it and subsequently forgot about it. Anyway, I’m probably the very last person on Earth to learn this. During Loadays in Antwerp last weekend, Fabian Arrotin mentioned this again, and I convinced him (in exchange of a beverage or two at the hotel bar) to show me. He demonstrated how he schedules Ansible jobs to run from within Jenkins, and the coin clicked as I watched what he did. In the course of today’s lunch break, I set up Jenkins on my laptop, installed a couple of plugins and everything I tried just worked. Fabian showed me the color plugin and mentioned the console column plugin which allows me to open the last console output at the click of a button from the dashboard. Within a very few minutes I was kicking Ansible playbook-runs by checking something into a git repository; a commit hook kicks off a Jenkins build. I think for things like Ansible, scheduled “builds” (think cron) will be tremendously useful, in particular because I can browse through prior build history etc. Within the same lunch break I had the MQTT sending me notifications of failed builds via mqttwarn. I’m getting addicted in spite of its UI, and I can’t wait for the weekend to read more about what Jenkins can do.